A question arises : are all these active galaxies different kinds of objects, or is it possible to find a single model, which would link all these objects together ? the active part is able to eject particles, to distances greater than millions of light years, with a speed of tens of thousands of kilometers per second. The nuclear reactions which take place inside stars are unable to produce enough energy to give such a result. The only conceivable energy is gravity, hence the following idea : in the nucleus of these galaxies, there is a tremendous black hole, which accelerates the surrounding gas in a huge accretion disk. With this hypothesis, calculations show that the "consumption" by the black hole of a few solar masses each year is able to provide the observed energy. Calculations show that this black hole must have a mass between one million and ten billion solar masses, and so we find a Schwarzshild radius between 10 light seconds and one light day (i.e. 0.02 to 200 au). AAccording to the hypothesis of a central black hole, we see all the types of active galaxies, depending upon the direction we view it and the intensity of the emission at radio wavelenghts. It should be said that the beam mechanism is not yet fully understood. The pressure of radiation generated by the light arising from the accretion disk will prevent it growing indefinitely. The result of this is a limit, called the Eddington limit, of the size and luminosity of a quasar. This theoretical limit is consistent with observations. The great majority of active galaxies lie far away from us, which means far in our past. So, they must be young galaxies relative to the estimated age of the universe. In the unified model, all galaxies went through an active stage. 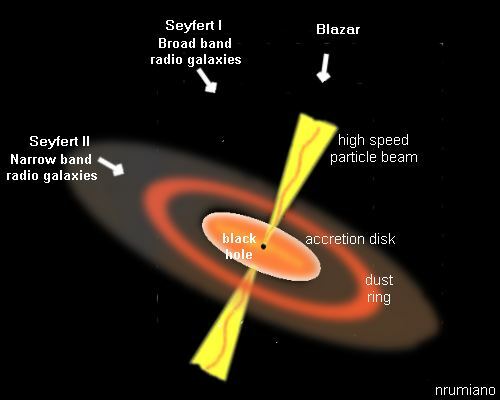 The transformation from a quasar to a Seyfert galaxy, then to an ordinary galaxy can hence be explained by the decrease in strength of the interaction between the black hole and its accretion disk. Under these conditions, we expect to find, in the nucleus of each spiral galaxy, a black hole, more or less heavy, according to the evolutionary stage of the galaxy. The search for these black holes has been undertaken with the help of the Hubble Space Telescope, by measuring the individual velocities of stars around the center of the galaxy. The results are true to the theoretical expectations. Here is a table of some galaxies, in which a supermassive black hole has been detected. It is interesting to note that the mass of the central black hole is proportional to the entire mass of the galaxy. This suggests that the growth of the black hole is tightly linked with the formation of the galaxy itself. Some recent studies lead to the hypothesis that the central black hole of a spiral galaxy could exist before the galaxy itself : it would act as a seed for the galaxy. Observations show black holes older than 12 billion years, thus older than the galaxy itself. If these measures could be replicated, it would so be a confirmation of the suggested hypothesis.